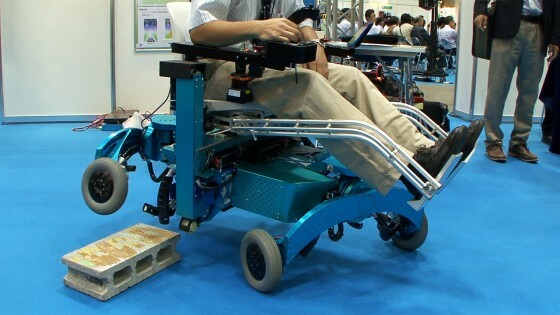 At the Chiba Institute of Technology, a group led by Shuro Nakajima has developed a robot wheelchair that can climb over steps. This robot can make a variety of movements, using its four-wheel drive and five axes. Normally, it rolls along on its wheels, but if there’s a step or ditch, it can get over the obstacle by using its wheels as legs. All the user needs to do is tell it which direction to go, using a joystick. The robot automatically assesses the surrounding terrain and moves appropriately. Also, when moving on uneven ground, the robot controls the seat to make sure it remains level. In addition, this robot can line its wheels up, and extend stabilizers to the left and right, enabling it to turn a circle. This makes it easy to reverse, even in a narrow space.